Spring is here and I’m itching to get cleaning! Today’s blog post is all about what you can do to clean up your workspace and infuse it with some adorable (and easy!) touches that will help you stay organized and look polished and stylish! I took over one of our desks in the office for a total makeover and absolutely loved the results & am ready to show you how to recreate them on your desk! First up : one of our new motivational acrylic blocks is the perfect paperweight. It does double duty by providing essential function while also inspiring and adding stunning metallic detailing to your desk decor! A medium acrylic tray is the perfect way to hold your desk accessories, office knick knacks and other miscellaneous items. Avoid adding clutter to your desktop and show some personal style with a gorgeous patterned tray. A rose gold mint julep cup is a trendy way to store loose pens or other supplies (also obsessed with the rose gold scissors from Anthropologie!) Any mug or cup will do to wrangle these loose items, but I went with the rose theme. If you can’t tell I’m kind of obsessed. A clear acrylic file folder holder from the container store is the perfect way to keep file folders organized. I mixed and matched geode folders in different color ways for a system that organized documents related to different departments. 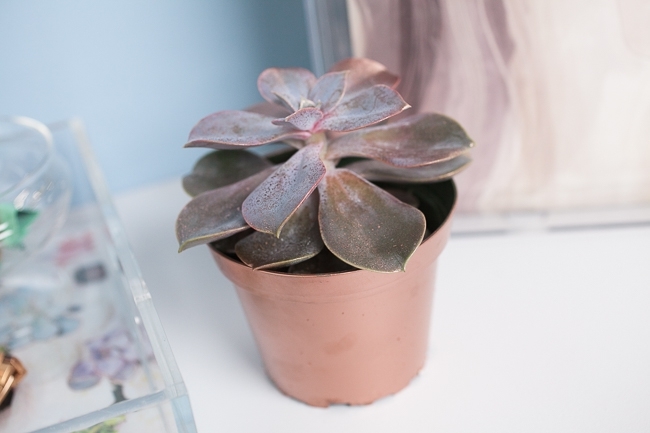 Flowers get expensive and and are hard to maintain, so I like to choose longer-lasting plants like this adorable succulent. Not only does it match the color scheme of the overall desk, but it barely needs any attention and it is too cute. 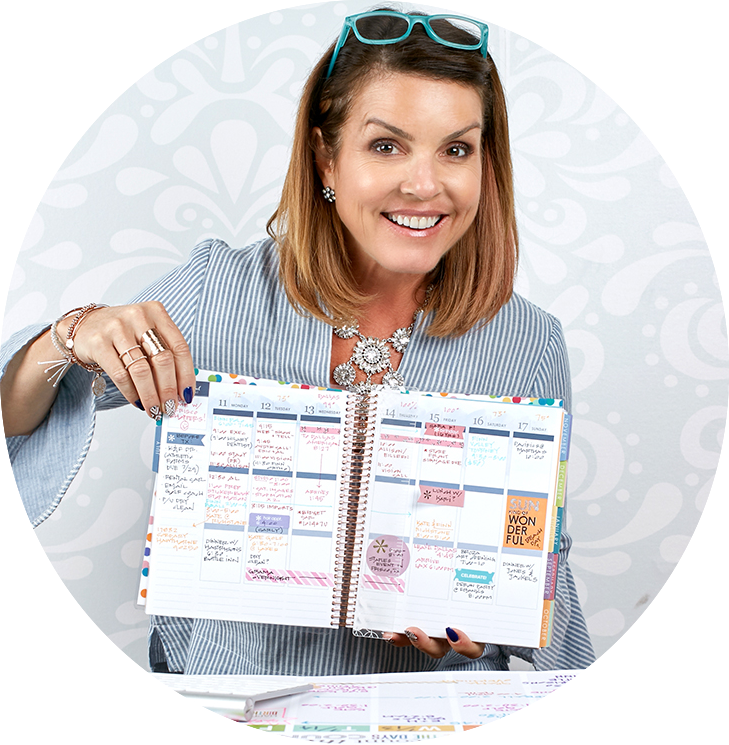 Of course the key to keeping it all together is a LifePlanner™ or TakeNote™ Notebook. 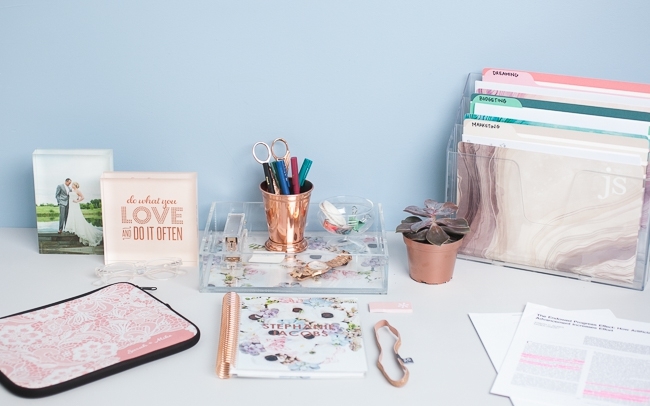 (Pictured is the stunning new In Bloom Rose Gold NoteBook!) A carry-all clutch is the perfect way to transport your book and protect it from any wear and tear from home to the office. The final product! It’s really that easy! Now I’m inspired to tackle mine….